A two-day donor conference in the Mauritanian capital Nouakchott ended on Thursday with pledges from the European Union and France to increase their financial contributions to development and security projects in Africa's volatile Sahal region. The EU said it would contribute an additional €125 million ($142 million) to the G5 Sahel's Priority Investment Program (PIP), bringing its total up to €800 million. France announced an extra €220 million for the program, bringing its total to €500 million. "Half of this sum is for projects already planned or under way," French Foreign Minister Jean-Yves Le Drian told the conference. "The other half will be awarded quickly over the next two years to enable you to meet your priorities." 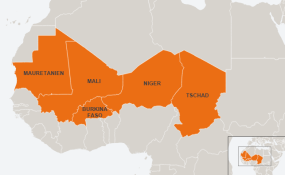 The five Sahel states of Mauritania, Burkina Faso, Chad, Mali, and Niger have been dealing with insurgent violence, lawlessness and terror attacks since Libya's political collapse in 2011 and an uprising in northern Mali in 2012. Niger President Mahamadou Issoufou said at the end of Thursday's meeting that donors had together pledged €2 billion. "These pledges from our partners broadly cover the overall needs" of 40 development projects intended to withstand jihadist attacks in the region, he added. "Terrorism, cross-border crime, drug smuggling and lack of security in the Sahel region are attributed to injustice, marginalization, underdevelopment, absence of education and unemployment among young people," Mauritanian President Mohammed Ouled Abdel Aziz said. The G5 Sahel's PIP is linked to the Sahel Alliance, launched last year by French President Emmanuel Macron, German Chancellor Angela Merkel and the EU's High Representative for Foreign Policy, Federica Mogherini. It aims to improve economic, humanitarian and political conditions throughout the region. The G5 Sahel countries launched a 5,000-strong joint combat force backed by the EU, France, Germany in July 2017 to tackle cross-border crime, illegal migration and terrorism. The United States, Saudi Arabia and the United Arab Emirates have also pledged their support. But Niger's President Mahamadou Issoufou has said only €18 million of a total €414 million previously pledged for the force had been received, undermining its ability to organize and deploy its soldiers across the region. In June, a group claiming to be the al Qaida-linked Support Group for Islam and Muslims, the main jihadist alliance in the region, attacked the force's headquarters in Mali. A gun battle left two soldiers, a civilian and two attackers dead.